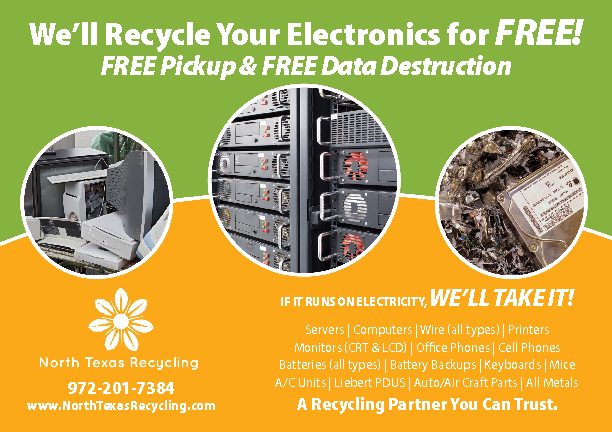 North Texas Recycling offers several levels of electronic and computer recycling to meet the different needs of our customers. Pick-up service is available for corporate and business customers on an as needed basis in the Dallas area including Plano, Richardson, Ft. Worth, Mid-Cities, Dallas, and surrounding municipalities. Container services are available for those customers that are producing a great deal of recyclable material, such as construction sites or corporate remodels. On-site drop boxes are available to our property management companies or for office buildings that have a secure area available to their tenants. Pick-ups are then scheduled bi-weekly, monthly, or on-call as needed. We have multiple drop-off locations in the metroplex. See the list below to find the location closest to you. All equipment that is dropped off is put in a secure area and a receipt is provided (if desired). North Texas Recycling can also purchase material depending on what it is. Feel free to call us if you have any questions. This is typically newer computers/laptops, wire, and computer memory. The proper handling of data bearing equipment like hard drives, cell phones, and tapes has never been more important. All material that is brought in is checked when received and during the break-down process to ensure that it is sanitized of all data. On-Site Hard Drive Shredding is fee-based depending on volume. 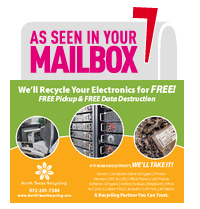 Off-Site Hard Drive Shredding includes the secure transfer of hard drives from the customer location to our warehouse. It is fee-based, depending on volume and distance. Hard drive sanitization is a free service. At North Texas Recycling we use Department of Defense (DOD) approved software to completely sanitize all data from your hard drives. Serialization reports are available upon request, and included in all Data Center clean-outs. Any items that cannot be sanitized completely and thoroughly will be destroyed. Similar to electronic recycling, cell phones contain several data bearing items including internal hard drives, SIM cards, and removable memory cards. All mobile phones are sanitized and broken down to commodity level for recycling. In some cases, customers have a large number of phones and want to inquire about selling them to recoup upgrade costs. In these cases, North Texas Recycling can help facilitate the process. Depending on the model and the needs of the secondary markets, this can be a lucrative option for some customers.